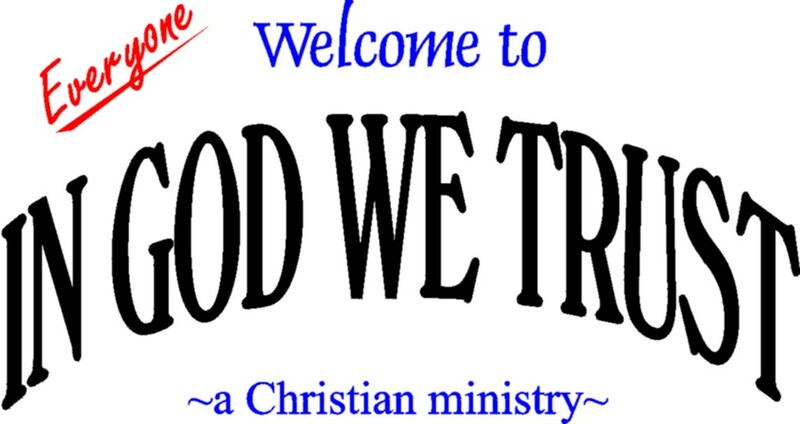 Our mission at In God We Trust is to proclaim the good news of salvation in Jesus Christ, as is written in the Holy Bible, through the power of the Holy Spirit, while also providing comfort, strength, and growth for those belonging to the family of Christ through education in God's word. It is becoming increasingly obvious that even as our economy and technology is rapidly advancing our society is getting more violent and less moral. While Christians possess eternal life, many miss the peace and strength that comes from having a personal relationship with the Lord Jesus Christ. Some Christians do not have the knowledge to give a basic defense or reason for their faith in Jesus Christ and the Bible, often times just resorting to, "well I just know it's true...." YES, we are saved by grace through faith, but, the more we approach what Paul speaks of, "maturing in Christ," the more we can understand and enjoy our salvation. Other people have never heard the "good news" or "gospel" of Jesus Christ in a way that makes sense or at all. If you are one who hasn't committed your life to Jesus, I would ask you to explore this site with a prayer that your heart would be open towards God. You don't need to worry, God doesn't drag anyone into Heaven against their will! Our Menu is at the bottom of this page- please read on and enjoy yourself! Ever wonder why we have "In God We Trust" on our currency? Visit our History Page!